Leibstandarte SS Adolf Hitler barracks in Berlin, the rifles are Mauser Kar98k. The 1st SS-Panzer Division Leibstandarte SS Adolf Hitler (LSSAH) was Adolf Hitler’s personal bodyguard. The LSSAH went on to become one of the most elite and hardened units in the German armed forces. The lightning bolts on their collars indicate clearly that they are SS. 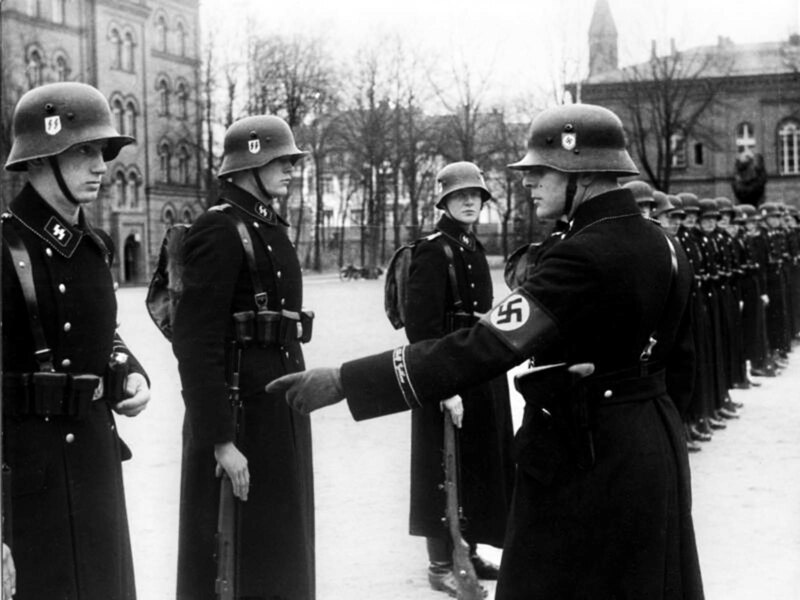 The LSSAH provided in the Nazi period for government officials, security personnel and government buildings. It was located in the rebuilt after World War II to “Barracks Royal Prussian Cadet School” former military academy in Berlin Lichterfelde West, where the training of recruit took place. The LSSAH represented the pinnacle of Hitler’s Aryan ideal. Strict recruitment regulations meant that only those deemed sufficiently Aryan—as well as being physically fit and National Socialists—would be admitted. The LSSAH provided the honour guard at many of the Nuremberg Rallies, and in 1935 took part in the reoccupation of the Saarland. The Leibstandarte was in the vanguard of the march into Austria as part of the Anschluss, and in 1938 the unit took part in the occupation of the Sudetenland. By 1939, the LSSAH was a full infantry regiment with three infantry battalions, an artillery battalion, and anti-tank, reconnaissance and engineer subunits. The rifles are not K98k's, they look to be Mauser K98b's with one having a straight bolt handle.